There are the lovers and there are the haters of Nutella. When it is spread in all its lusciousness into the base of a buttery pastry crust, it’s not that easy to say no to just a slice! 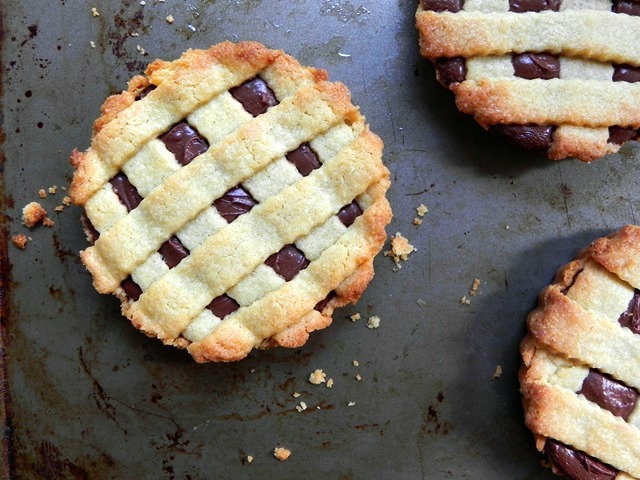 You could make mini nutella crostata for your sweethearts this week and really surprise them! You see, Nutella brings back memories of being a kid in Italy. There were many a summer I would be hanging out with some of my cousins, usually under an umbrella on the beach, and one of my aunts would cut open a wonderful, crusty bread and spread it with Nutella. And there you go! That was our merenda: our afternoon snack! There was really nothing better to eat at that moment in the whole world. I see my sister-in-law sometimes offer it to the kids in the summer in Italy. And I was just on the phone yesterday with my American expat friend that has lived in Italy for 15 years. Guess what she was making her 11 year old? Un panino con la Nutella (a Nutella sandwich). Maybe the ingredients are different in the one made in Italy.I read a little about the differences here. Maybe it’s a slightly different recipe. I’m not sure and haven’t looked into it that much. But there is usually some Nutella here on hand and more than often, it will be spread into a homemade crepe…oh, my, yesssss! Total. heaven. in. a. crepe! So, you see, enjoying Nutella could be like most things that aren’t the best for you. In moderation, why not sometimes? If you’re truly not up to buying Nutella, you could even make your very own chocolate spread!! The pasta frolla dough is enough for one regular size tart pan if you don’t have the mini size pans. A fantastic dessert for Valentine’s day! You could prepare the dough ahead and let it chill in the refrigerate until you are ready to work with it (up to 7 days.) Buon Appetito! The dreamy and creamy Nutella is comfortably nestled between two buttery and flaky crusts. Well, the top crust is sliced into strips. But still, it is decadent and it is lovely. I made them mini size. They aren’t that big at all and seriously, if you are looking for just a little decadent treat, have a couple bites, it may be all you need to get your Nutella fix. Share one crostata with your sweetheart…it’s perfect for two! Or, if you have been working out and really being good, enjoy one all by yourself! I’m sure you deserve this special treat! If you like BUNDTS, you should check out my Nutella Swirl Bundt Cake. Love this Nutella Espresso Panna Cotta! Chocolate Nutella Peanut Butter Fudge…yes, it exists and it’s adapted from Giada! 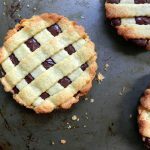 If you love chocolate you will love these Mini Nutella Crostata! Buttery Italian pastry dough filled with luscious Nutella! In the bowl of a food processor, add the flour and sugar and process a few times to mix together. Next add the butter and pulse a few times until the mixture looks like wet sand. Add the egg and yolk and process a few seconds more until the dough forms . Be sure to not over process the dough. Dump the dough from the food processor bowl onto a lightly floured counter. Form the dough into four disks and chill in the refrigerator for about an hour. When the dough is nicely chilled, remove from the refrigerator. Roll out the first piece of dough between 2 sheets of plastic wrap into a 1/8-inch thick or slightly thicker. 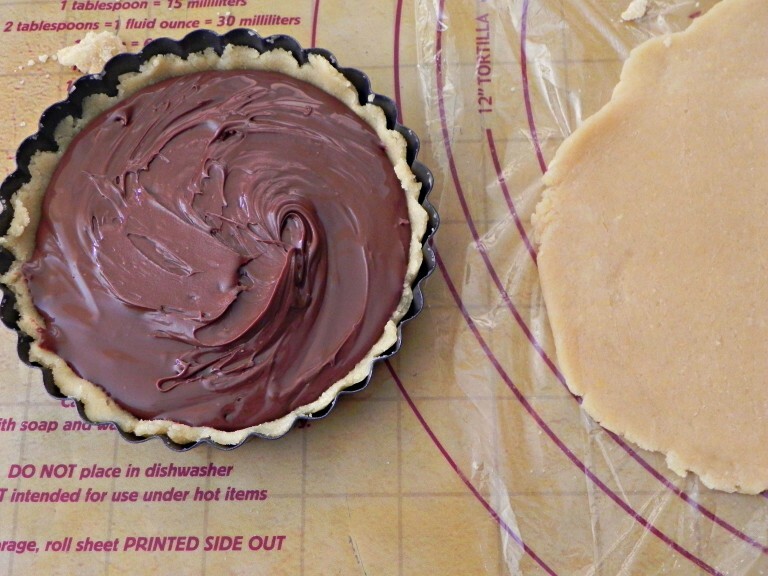 Keep other pieces of dough chilling while assembling the tarts one at a time. Spray a mini fluted tart pan with removable bottom with baking spray. Gently wrap the dough over the rolling pin and place it over the first mini tart pan (or an 11-inch fluted tart pan); release the rolling pin and let the dough fall into the tart pan. Press the dough softly into the bottom of the tart pan. If some of the dough breaks while you press it into the tart pan, that’s not a problem. Simply piece the dough together. Press the sides of the dough about 1/2 -inch up the side of the tart pan. 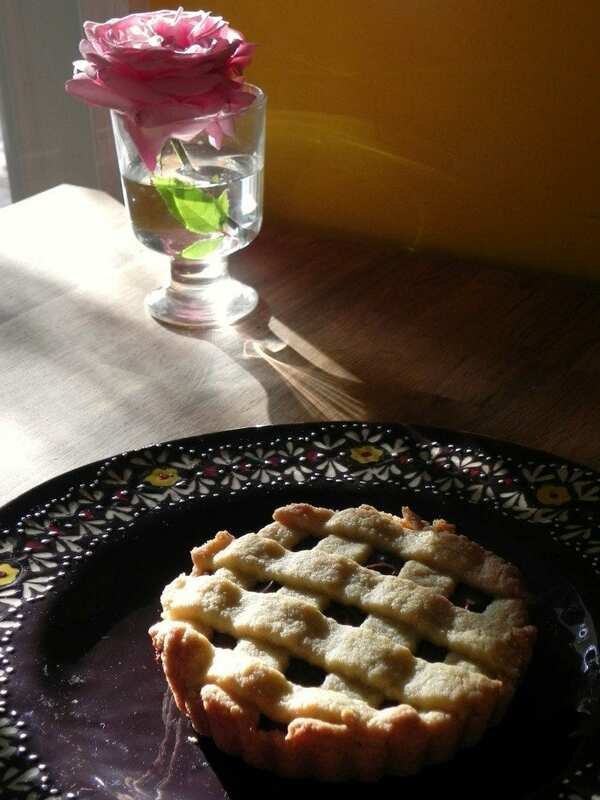 The rim of the tart should be lined with a slightly thicker layer of pastry than the bottom (about 1/4-inch thick). Cut off the extra dough from the sides and keep these excess pieces to make the lattice topping. Repeat this process with the remaining 3 tart shells. Wrap the remaining dough in plastic wrap. Place the remaining dough and the tart pans in the refrigerator for about 30 minutes to chill. When the tart shells are chilled, remove them from the refrigerator and prick the pastry bottoms with a fork a few times. Fill each tart shell with Nutella almost all the way to the top. Roll out the extra dough into lattice strips. Place the dough strips in a criss-cross pattern over the Nutella. Repeat the same process with the remaining three tart shells. Place the mini crostatas on a baking sheet and bake for about 25-30 minutes at 375 F, or until the crust is a light golden brown. *Check the crostata at 25 minutes. Every oven is different. The crust should not be too brown.